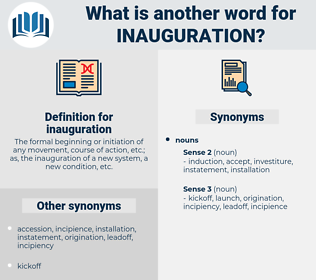 What is another word for inauguration? The formal beginning or initiation of any movement, course of action, etc. 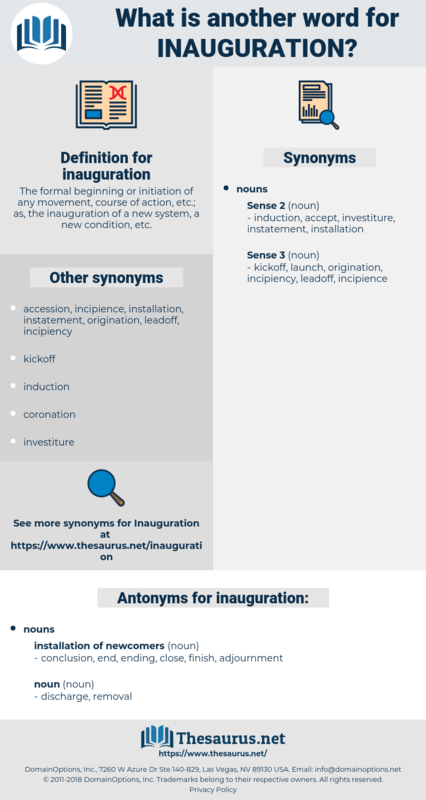 ; as, the inauguration of a new system, a new condition, etc. creation, appointment, introduction, commencement, proclamation, assumption, re-opening, arrival, advent, Appointing, promulgation, tenure, operationalisation, takeover, start-up, possession, oath, launching. investiture, installation, nomination, unveiling, inception, swearing, operationalization, ceremony, celebration, commissioning, setting-up, completion, opening, launch. conclusion, end, ending, close, finish, adjournment. And then the Countess said that Denry ought certainly to go with her to the inauguration ceremony. Here, then, is the " President Series," which contains the name and the date of inauguration of each President from Washington to Cleveland.